How to resist this invitation, especially if it involves poetry? The United States is a vast country full of amazing places. Come travel the nation and explore beautiful landscapes, fascinating historical sites, and entertaining cultural destinations. Witness the grandeur of Denali on a summer night, the lively street life of Harlem’s West 125th. Street, the thrill of “flying” while touring a miniature circus, the thundering power of water of Niagara Falls, the enticing array of food and shops in San Francisco’s Chinatown, and more! This is a lovely collection – one I can’t wait to share with my kids, the majority of whom are New York Yankees fans (sigh), but also lovers of great poetry. I have to confess, that Amy March was the least favorite character in Louisa May Alcott’s Little Women; I saw myself in Jo, and shared her impatience with Amy’s frivolous and vain ways. Now, thanks to Jeannine Atkins’ brilliant imagining of May Alcott, the sister Louisa loosely based the character of Amy upon, I have a whole new understanding of the youngest of the Alcott sisters…and a better appreciation of the woman she really was. Little Woman in Blue begins with Anna’s wedding; May, looking ahead and wondering about her own future, yearns to leave Concord, to travel to Europe and see for herself the great paintings of Michelangelo and Raphael, and give her own artistic aspirations free reign. But, the lot of the unmarried daughter in May’s day was to tend to her family’s needs at the expense of her own freedom and inclinations to pursue a life of her own. Even so, May works hard to cultivate her love for and talent at painting, and achieves no small measure of genuine praise for her work. When Jo’s famous novel is published, however, May is stunned and distressed to read the fictional portrayal that she must have known would come to define her, to be the May Alcott the world would believe as real. Still, she perseveres; a journey to Europe as the chaperone of a young friend finally brings her into the art world of Paris, just then exploding with the revolutionary talents of the Impressionists, and J.M.W. Turner. May, at last, finds first her artistic oeuvre, and then love. Little Woman in Blue is such an engrossing read – Atkins has throughly researched both the intellectual scene in Concord (we get to rub elbows with Thoreau, Emerson, and Hawthorne!) as well as the artistic scene in Paris (we meet Degas, Manet, Mary Cassat! ), and the reader feels very much a part of these richly recreated scenes and conversations. May’s own struggle to create and preserve an artistic authenticity at a time when women were simply not given opportunities to do so, was especially poignant to read. I am so grateful that Jeannine was one of those people she writes about in her afterword, who did “pause to consider paintings May left behind and wonder about the woman who held the brush.” She is a most fascinating woman, indeed. Alex Gino’s George is an incredibly brave and beautiful book. George looks like a fourth grade boy, but knows deep down that he is really a she. This is a secret George can tell nobody, not even his best friend Kelly or (especially) his otherwise loving and very “chill” mom. When it is announced that their grade will perform Charlotte’s Web, the book they have read aloud as a class and immersed themselves in heart and soul, George knows that there is only one part for him – Charlotte. But, his teacher believes that Charlotte is a girl’s part, and that is that, even though George’s audition as Charlotte was absolutely perfect. George must decide if he can trust Kelly with his secret, and find a way to share that secret with his mom…and then the school. Alex Gino writes George’s story with all the compassion it deserves. As an educator, I have read statistics which paint a terribly sad picture of what children like George must endure: 82% of transgender youth report that they feel unsafe at school, and that these children are more than eight times more likely to attempt suicide. Books such as George allow us insight, they foster a culture of kindness, and they allow for conversations. It’s Monday and here’s what I’m reading (#IMWAYR): Lost In The Sun & There Will Be Bears. Everyone says that middle school is awful, but Trent knows nothing could be worse than the year he had in fifth grade, when a freak accident on Cedar Lake left one kid dead, and Trent with a brain full of terrible thoughts he can’t get rid of. Trent’s pretty positive the entire disaster was his fault, so for him middle school feels like a fresh start, a chance to prove to everyone that he’s not the horrible screw-up they seem to think he is. Trent’s search for solace and redemption is beautifully crafted – there are no easy answers, and Graff does a magnificent job of writing about the complexities of life, death, divorce and trust with an entirely believable middle school aged voice. His unlikely friendship with Fallon, and the way in which he copes with school bullies, adds another layer to this story. I loved that the origin of Fallon’s scar remains a mystery, after all, not everything needs to be spelled out in order to be understood. I also loved how Graff described the often messy way in which adults handle divorce; I see this play out in my classroom with students all the time, and I know many of them will appreciate the way she describes the ineptitude of some parents as they juggle divorce, remarriage, second families. Best of all, there is one parent (Trent’s mom) who manages to behave like an adult, with compassion and patience for her son’s muddled feelings of anger and abandonment. Kids need to read about adults like this, it gives them hope. I can’t wait to share this with my sixth graders – a wonderful selection for a readaloud or book clubs. Thirteen-year-old Tyson loves hanging out with his roughneck Grandpa Gene, who’s a lot more fun than Tyson’s ex–best friend, Brighton. These days, Bright just wants to be seen with the cool jocks who make fun of Tyson’s Taylor Swift obsession and dorky ways. So when Grandpa Gene has to move to a nursing home that can manage his kidney disease, Tyson feels like he’s losing his only friend. Not only that, but Tyson was counting on Grandpa Gene to take him on his first big hunt. So in defiance of Mom and Dad’s strict orders, and despite reports of a scary, stalking, man-eating grizzly named Sandy, the two sneak off to the Grand Tetons. Yes, there will be action, like shooting and dressing a six-hundred-pound elk. Is Tyson tough enough? There will be heart-pounding suspense: is Grandpa Gene too sick to handle the hunt, miles away from help? And, oh yes, there will be bears…. Tyson is funny in the kooky way middle school kids are, and reading this story made me miss my sixth graders (no kidding!). Although he is dealing with a serious issue, Grandpa Gene is getting old and in failing health, Gebhart manages to weave in moments of both hilarity and insight. The last part of the book, the part of high (bear related) drama, will have my kids laughing out loud as I very nearly did. A fun read, as my kids would say. Visit Teach Mentor Texts and Unleashing Readers who host this each week. The struggle for civil rights is an ongoing one, and we are still made aware of the distance left to travel on this road by news events here and there across our country. This struggle seems especially stark in our armed forces, where brave men have stepped up to fight for their country and make the ultimate sacrifice for its principles of freedom and equality for all, only to be told that their fair and just treatment is wholly dependent upon the color of their skin. The Port Chicago 50 captured the interest of my students, and I can see why. 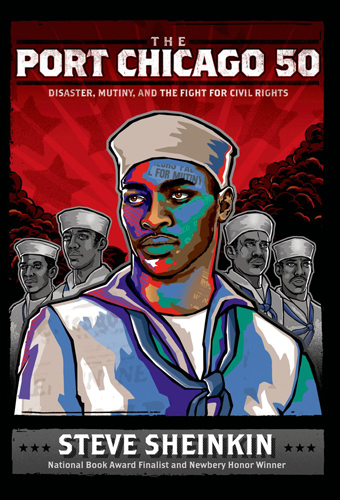 The first person accounts and photographs lend an immediacy to this story, which unfolds as its main characters (the young men who signed up to serve only to discover how little their patriotism was really valued) first suffer the consequences of institutionalized racism, and then fight to clear their names. I had not known about Thurgood Marshall’s role in this event, or of its link to the larger Civil Rights movement itself, and the strategizing that was involved was fascinating to read about. So, too, was reading about the political debate within the armed forces, as they debated and stalled integration even as the country and the service men themselves were moving forward. The Port Chicago 50 will be an important selection in our nonfiction book clubs next year, as well a mentor text for our civil rights unit of study. I can’t wait to share it with my whole class next year. Ehrlich is a lyrical writer, and Chirp is a character who is easy to imagine and love. But, spoiler alert, the way Chirp’s mother handles her diagnosis of MS is problematic for me, also a mother diagnosed with a chronic disease. The relationship Chirp shares with her mother is achingly beautiful, as described by Ehrlich, full of the small moments and memories that parents weave together with their children from their earliest moments. This makes it all the more difficult to follow the psychological deterioration of Chirp’s mom, as she is unable to come to terms with her disease and slips away from the family into a world of guilt and fragility. As a reader, and as a mom, I was so hoping that somehow Chirp’s mom could pull through, certainly her family was doing all it could to be brave and hopeful. When she drowns herself (a la Virginia Woolf), I had to put the book down and cry. 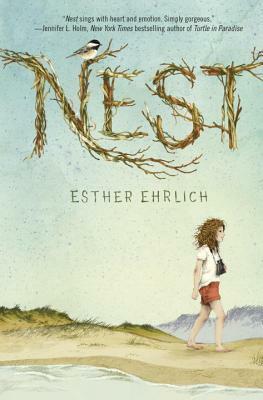 I loved Nest, and yet… This would be a book that I would have to consider very carefully when handing out to my sixth graders, although I know they would love the story and be moved by its beautiful writing. I remember the days of having pen pals and racing to the mailbox to see if my latest letter had elicited a response from a pen pal in far away Germany, Japan, or Denmark. Sometimes, stickers or photographs would be included, and sometimes (oh, joy!) a small package would arrive brimming with exotic candy and unusual treats. In this age of Snapchat and Instagram, none of my students have, or even seem interested in, pen pals. And that is sad, especially when one reads of the way a pen pal can be a window into a life you can never imagine. I Will Always Write Back: How One Letter Changed Two Lives is the perfect example of just such a window that opened up new worlds for its authors – Caitlyn Alifirenka, a “typical 12-year old American girl, far more interested in what I should wear to school than what I might learn there”, and 14 year-old Martin Ganda of Mutare, Zimbabwe. At first, Caitlyn writes breezy letters filled with her friendship dramas, trips to the mall, and school gossip. And, at first, Martin tries to keep his real life from his pen pal. His family struggles to put food on the table, and there are times in which it is a choice between paying school fees and covering the month’s rent. But, bit by bit, letter by letter, Martin shares the difficulties of eking out the bare necessities of life in a country ravaged by economic and political problems. For Martin, a gifted and brilliant student with hopes and dreams of furthering his education and having a different life, every day is a struggle to have enough food, and hold on to some semblance of stability. Once Caitlyn is able to read between the lines and discover what Martin is really up against, her generous spirit and sense of compassion and fairness propels her into activism. Together with her remarkable parents, she is able to affect change in Martin’s life and his prospects for a better future. The book is arranged in chapters told in the voices of Martin and Caitlin, with snippets of their actual letters woven in. i loved the way the story of this friendship grew over the years, with each friend learning more about the others’ world. I especially loved the way Cailyn’s understanding of Martin’s life expanded her own thinking about what is important, what really matters. So many of the kids I teach are in the same sort of bubble of privilege and entitlement as Caitlin was, so it would be an eye opening experience to read about Martin’s life – about the way, really, that so many of the world’s children live. I Will Always Write Back: How One Letter Changed Two Lives is a must have book for classroom libraries- I am so glad that I had a chance to read it, and can’t wait to share it with my students. I can envision many meaningful class discussions about social activism and awareness. Perhaps I can even encourage my kids to start thinking about pen pals!